Any size you require. Swing tickets are simply small cards with a hole drilled through the top. You can choose any size you like, bearing in mind the smallest size our guillotines can cut to is 40mm by 40mm. Heavyweight card. We use 400gsm (grams per square metre) card for our swing tags, which has a luxurious feel and is far less likely to tear than lighter weight card. You can also specify gloss or matt lamination which adds strength and makes the tags more attractive. By laminating one side only, you can still write on the reverse side. Easy to affix to clothing using a standard tagging gun. For garment tagging guns, kimble tags and needles, we recommend you visit Viking Direct and use their website search facility for 'tagging guns', although naturally there are other suppliers of the same goods you may prefer to use. Use alternative ways to attach your swing tags. Usually we drill your swing tickets with a 3mm hole to suit kimble tags (the small plastic I-shaped tags used in tagging guns), but if you intend to use ribbon, twine or raffia to attach your tags, you can specify a larger 6mm hole. There is no difference in price. Applying a gloss or matt laminate to swing tickets has advantages and drawbacks. The main advantages are an improved appearance, especially if the ticket has large areas of dark colours (these tend to show up fingerprints, whereas a laminated surface repels the skin's natural oils). 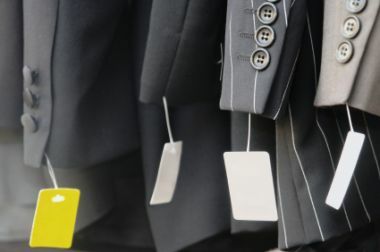 They also add extra strength to the tag which may be important for high-footfall stores where garments are handled a lot by prospective customers. The main disadvantage is that tags cannot easily be written on if they are laminated, except by a marker or similar type of pen. Some ball pens will write on matt laminate, but if in doubt, please request free samples and test them before placing an order. Swing tickets are standard rated for VAT. We can print barcodes in all of the major symbologies, plus newer 3-D codes (datamatrix, QR and so on) on your swing tags. If you need unique barcodes for each individual tag, we can supply sheets of barcodes printed to your exact specfications – please see our Barcode Labels page. If you would like to see the 400gsm material we use for our swing tags, we will send you samples of our unlaminated, gloss laminated and matt laminated business cards (add these to your sample basket) as this is exactly the same type of card we use for swing tickets. The only difference is that the cards, when delivered to you, will be drilled with a 3mm or 6mm hole as required.